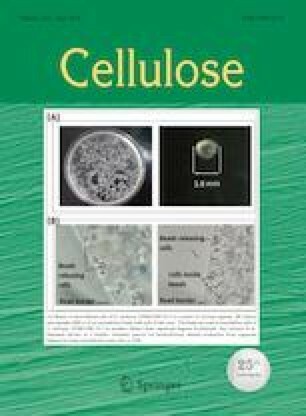 We investigated treatment of cellulose paper with a phosphoric acid–urea solution for increasing the wet strength. First, a filter paper was immersed in a phosphoric acid–urea solution (phosphoric acid: urea mole ratio = 1:0, 3:1, 1:1, or 1:3). Next, the filter paper was put between glass plates and heated at 80–140 °C for 15 min to 3 h. Then, the filter paper was washed for 1 h in distilled water. After washing, the filter paper was dried in a hot press at 110 °C and 1.1 MPa for 1 h. We investigated disintegration by immersing the prepared filter papers in distilled water. The paper treated with the 1:3 phosphoric acid–urea solution did not disintegrate. The optimum concentrations for developing the wet strength of the paper were 1.2–2.5 M phosphoric acid and 3.7–7.5 M urea. The optimum treatment time and temperature were 1.5 h and 140 °C, respectively. The wet strength of the paper increased after treatment with the phosphoric acid–urea solution. This method is a viable alternative to treatment with chemicals such as polyamidoamine epichlorohydrin. The online version of this article ( https://doi.org/10.1007/s10570-019-02423-y) contains supplementary material, which is available to authorized users. This work was supported by a Grant-in-Aid for Scientific Research (C) (Grant No. 16K07810) from the Japan Society for the Promotion of Science (JSPS). We thank Gabrielle David, Ph.D., from Edanz Group (www.edanzediting.com/ac) for editing a draft of this manuscript.